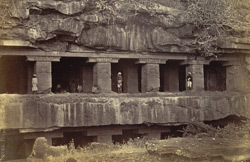 Photograph of the Das Avatara Cave at Ellora, part of the Allardyce Collection: Album of views and portraits in Berar and Hyderabad, taken by J. Johnston in the 1860s. The site of Ellora has a spectacular series of Hindu, Buddhist and Jain cave temples excavated into the rocky façade of a cliff of basalt. The works were carried out under the patronage of the Kalachuri, the Chalukya and the Rashtrakuta dynasties between the sixth and the ninth Centuries. The Das Avatara Cave (the Ten Incarnations of Vishnu) was started as a Buddhist monastery, but in the eighth century was converted into a Hindu sanctuary under the patronage of the Rashtrakuta king Dantidurga (c.730-55). It consists of an open courtyard and a two-storeyed hall at the back, which was the original Buddhist monastery. The walls are covered with reliefs illustrating Hindu mythology and the columns are decorated with elaborately carved foliage motifs. This view shows the top storey of the cave.